Our new release is out today! Don’t miss this! Strobian – Round & Round (Feat Listen) OUT NOW! 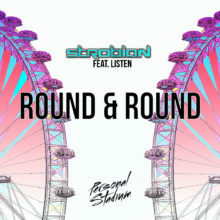 Strobian-Round & Round (Free Download) Our new track from Strobian – Round & Round (Feat Listen) is available at retailers and Spotify. Don’t miss this! Lowdown is being featured this month at Symphonic! To Spotify or not to Spotify? ?